Click here, or the image, for larger size. We're Personal Trainers, not marketing experts. All newcomers get to trial 3 x session free. We want you to make up your own mind! Sessions last for 45 minutes unless noted otherwise. 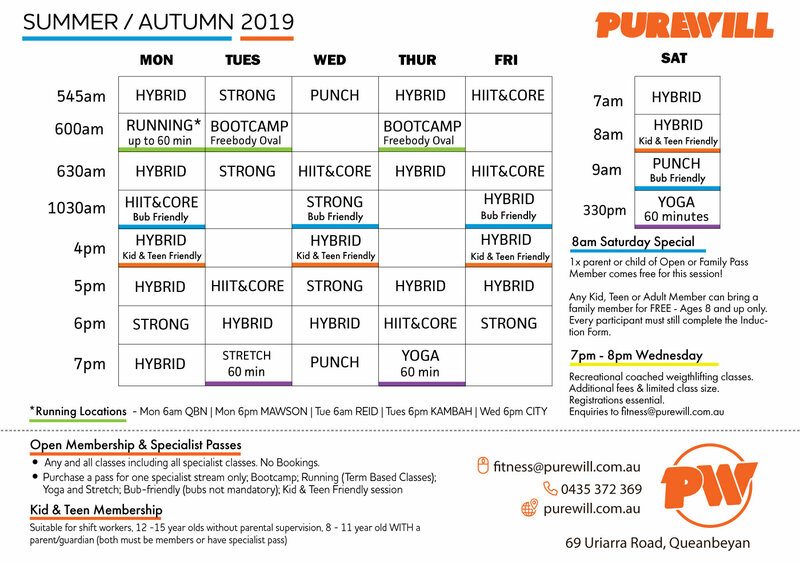 At Pure Will we start on time, every time. For safety reasons, if you arrive after the start of class Pure Will reserves the right to refuse participation. Open Members or Family Pass Members can bring another family member for free. Ages 8 years and up. Yoga and Mobility class only Membership available. Strength circuit classes. Mixed use of free weights and body weight to strengthen bodies through controlled and focused movements. Non-combative boxing style workouts for fitness. Fantastic whole body workouts and sweat fests. Functional mobility through active flexibility, foam rolling, self massage and controlled functional movement training. Functional workouts that blend all training modalities. Battle ropes, animal movements, kettlebells & mixed traditional and modern training styles. Harness the heavily researched benefits of high intensity interval training for heart health and weight loss. Accessible Yoga tought in a friendly, open class by certified instructors.